Every week a different FADER staff member will pick a clothing item or accessory that he or she has lately been spending a lot of time with—or would like to—and write a little love letter to it. We would’ve done a column on who we’re dating but that seemed a little bit much. 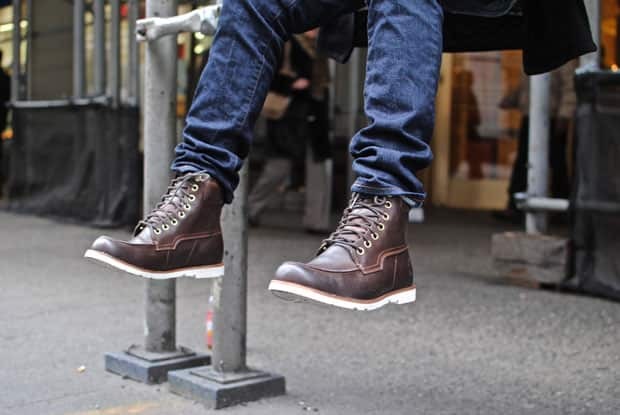 This week Sam Hockley-Smith talks about his Timberland Earthkeepers. It's weird to think about now, but there was a point when New York's streets were narrowed into winding trails by massive banks of snow. It went on forever and was at first fun, and then kind of annoying, and then an active deterrent to going outside at all if it could be avoided. I spent a lot of last winter inside, but when I was outside I was likely wearing my Timberland Earthkeeper boots. Except when I lent them to my dad and he was amazed by how light they were and then I left them at my grandmother's house, where they still are. Whoops! I recently noticed that Timberland had added a couple updated styles, including the ones I'm wearing in the picture above. They're still light and comfortable, but they feel even more sturdy and slick—like they fit the contours of my foot better, or something. I haven't had the chance to test them out in any sort of extreme weather circumstance. Which, in the scheme of my life and emotions is good, but in the scheme of using footwear? Bad. There's still plenty of time though. Plenty of time for that leather to wear down. Plenty of unnecessarily long walks on hazardous sidewalks. Plenty of rainstorms that would soak my socks if I were wearing just about anything else I normally wear. In the scheme of things, a boot is a boot. If it doesn't tear up your foot and it keeps you warm and dry, it's a good boot. How rare is it to find one you're completely stoked on? Apparently not as rare as I thought.